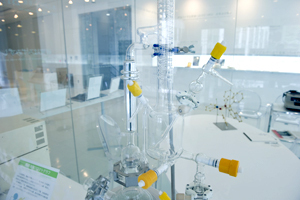 Collaboration between Nagoya University and Cornell University develops improved model to assess the ability of black carbon to warm the Earth's atmosphere. Fig. 1: Importance of particle size and coating amount of black carbon (BC) particles. Panel a: Particle size and number concentration can be different even if the total amount (mass) of BC is the same. Panel b: Particle size and coating amount determine the solar absorption efficiency of BC. Many BC particles are emitted as pure BC particles (BC particles without coating). BC particles are gradually coated by other aerosol species such as sulfate and organic aerosols through aerosol processes in the atmosphere (arrow). These aerosol processes enhance BC absorption efficiency by up to a factor of 2. Nagoya, Japan - Black carbon refers to tiny carbon particles that form during incomplete combustion of carbon-based fuels. Black carbon particles absorb sunlight, so they are considered to contribute to global warming. However, the contribution of black carbon to the heating of the Earth's atmosphere is currently uncertain. Models that can accurately assess the warming effect of black carbon on our atmosphere are needed so that we can understand the contribution of these tiny carbon particles to climate change. The mixing state of black carbon particles and their particle size strongly influence their ability to absorb sunlight, but current models have large uncertainties associated with both particle size and mixing state. 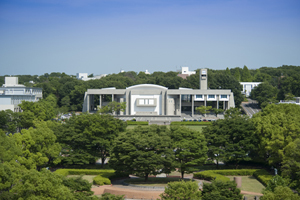 Researchers from Nagoya and Cornell Universities have combined their expertise to develop a model that can predict the direct radiative effect of black carbon with high accuracy. The team achieved such a model by considering various particle sizes and mixing states of black carbon particles in air. Fig 2. A schematic figure showing the treatment of particle size and coating amount in model simulations (panel a) and aerosol processes treated in the global aerosol model (panel b). Panel a: Many model simulations were made by changing particle sizes at emissions (e.g., "Small size" and "Large size"). The "Detailed method" can simulate various coating states of BC particles (pure BC, thinly-coated BC, thickly-coated BC etc.). The "Simple method", which is similar to the method used in many previous modeling studies, cannot resolve different coating states of BC particles sufficiently. Panel b: Aerosol processes in the atmosphere (emissions, transport, transformation, and deposition processes) and their impact on BC heating effect are simulated in the global aerosol model. "Most aerosol models are using one or two black carbon mixing states, which are not sufficient to accurately describe the mixing state diversity of black carbon in air," says Hitoshi Matsui. "Our model considers that black carbon particles have multiple mixing states in air. As a result, we can model the ability of black carbon particles to heat air more accurately than in previous estimates." The researchers found that the direct radiative effect of black carbon predicted by their model was highly sensitive to the particle size distribution only when the complex mixing states of black carbon were suitably described. High sensitivity was obtained by the developed model because it calculated factors like the lifetime of black carbon in the atmosphere, the ability of black carbon to absorb sunlight, and the effect of materials coating the black carbon particles on their ability to absorb sunlight realistically. All of these factors are influenced by the particle size and mixing state of black carbon. Fig 3. Ranges of BC heating effect (global mean). 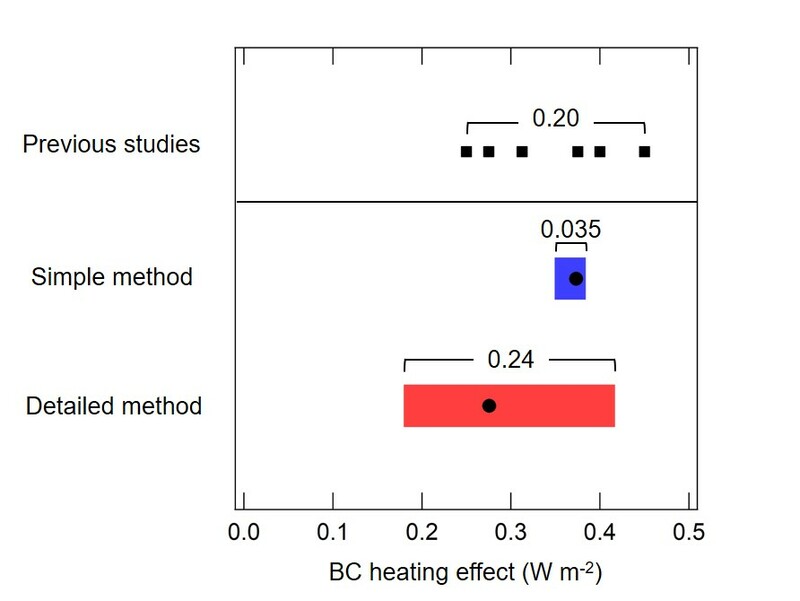 Horizontal bars in the "Detailed method" and "Simple method" show the ranges of BC heating effect when emission particle sizes are changed within their current uncertainty. The "Detailed method" has 7 times greater range of BC heating effect than the "Simple method" (0.24 W m-2 in "Detailed method", 0.035 W m-2 in "Simple method"). Circles in the horizontal bars show BC heating effects when average particle sizes are used for emissions. 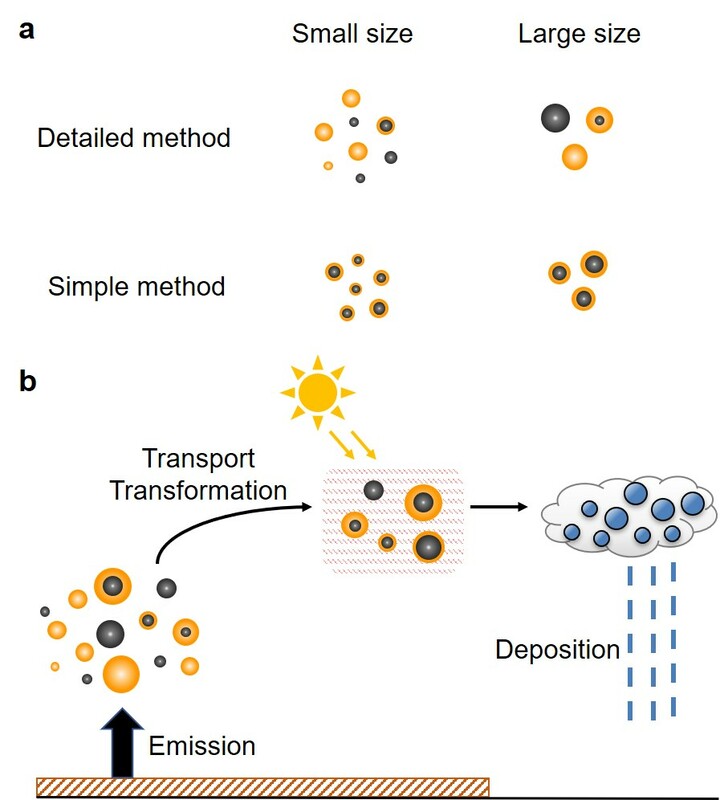 The results show that properly describing the particle size and mixing state of black carbon is very important to understand the contribution of black carbon to climate change. Fig 4. Ratio of BC heating effect between the two simulations with the smallest and largest particle sizes at emissions. The ratio has higher values (is close to 1) when emission particle sizes are important (not important) for the estimation of BC heating effect. The team's results suggest that the interactions of black carbon with atmospheric and rain patterns are likely to be more complex than previously considered. The developed model improves our ability to estimate the effectiveness of removing black carbon from the atmosphere to suppress future changes in temperature, which should help to direct research on strategies to mitigate climate change. 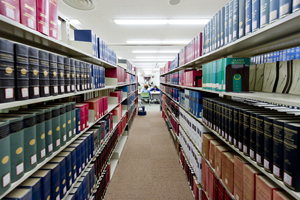 Funding: H.M. was supported by the Japan Society for the Promotion of Science (JSPS) Overseas Research Fellowships. This work was supported by the Ministry of Education, Culture, Sports, Science, and Technology and the Japan Society for the Promotion of Science (MEXT/JSPS) KAKENHI Grant Numbers JP26740014, JP17H04709, JP26241003, and JP16H01770 and MEXT Green Network of Excellence (GRENE) and Arctic Challenge for Sustainability (ArCS) projects. This work was also supported by the Environment Research and Technology Development Fund (2-1403, 2-1703) of Environmental Restoration and Conservation Agency. D.S.H. and N.M.M. acknowledge support from Atkinson Center for Sustainable Future at Cornell University. The authors thank Yutaka Kondo (National Institute of Polar Research in Japan), Nobuhiro Moteki (University of Tokyo), and National Oceanic and Atmospheric Administration (NOAA) Black Carbon Group for providing us their BC data of aircraft measurements.